Bay Front Condo w/ Pool One Block from the Beach! Welcome to the Makai, One of Ocean City Maryland’s newer condominium complex's, located on the Isle of Wight Bay on 42nd street, w/ an indoor tropical pool, next to the Convention Center! Ask about our 10% DISCOUNT promo BEFORE making your reservation. Enjoy a luxurious open floor plan in this newly built 2 bedroom, 2 full bath, Ocean City condo with ceramic tile floors in the living areas, and carpeted bedrooms. 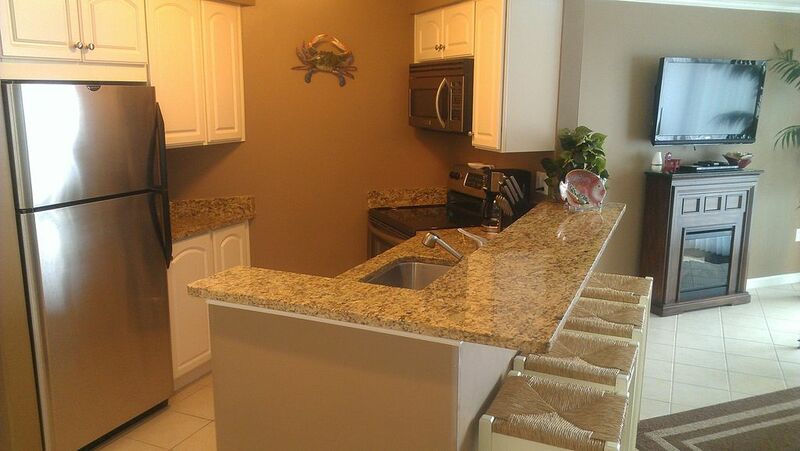 Impressive Granite counter tops accent a fully-equipped kitchen with stainless steel appliances. This unit includes a full size washer and dryer and central air and heat. Non-smoking, No pets. The kitchen looks into the living area with a nice comfy couch and chair facing an electric fireplace and 42' high definition LCD TV mounted over top with a Blu-Ray & DVD player. How about your own private balcony with a beautiful view of the Isle of Wight Bay. Have a seat on one of the balcony chairs and set your drink down on one of the balcony tables. Now your vacation begins! The master bed room features a king sized bed, a private entrance to the balcony, walk in closet, master bathroom, wall mounted high definition LCD TV, and a beautiful view of the bay! The guest bedroom features a queen sized bed, a nice sized closet, its own wall mounted LCD TV, and a second full bathroom right next door. THE CONDO IS EQUIPPED WITH HIGH SPEED INTERNET. The Makai has a private parking lot. The first floor features; an indoor tropical pool, Fitness center, Sauna, Billiards room, Activity room, and TV lounge with WiFi. Also you have parking spaces for two vehicles and an outdoor deck on the bay side. You are just a short walk from the ocean, and less than a ten minute walk from; the convention center, Dough Roller, 'On the Bay' crabs, Mackey's, the 45th Street Village, and the second happiest place on earth...Seacrets 'Jamaica USA'! Now that you are all settled in, it's time to go out and have some fun...enjoy your vacation! My wife and I met in Ocean City and got engaged on the Ferris Wheel down by the inlet. Rainy days are not a problem at the Makai. There is plenty to do. Whether it is; relaxing by the indoor pool, sitting in the sauna, shooting a game of pool in the billiards room, or maybe working off a few calories in the fitness center. It's all here! We are one block from the beach. We are just one block from the ocean. Beautiful View of the Bay! The coffee table is full of board games. There is a billiard room with two tables. Bring your bike, a bike rake is available outside the building. Electric Fireplace & Blu-Ray & DVD player. Handicapped Accessible (may have limitations). Minimum Age Limit for Renters. The bay front condo was very clean and welcoming with a lovely view. I cannot think of a thing that needs improving upon with this condo. We would consider staying again. Drake is very communicative and helpful. You won't be disappointed! We stayed off season and still found plenty to do in the area! OCMD is one of our favorite spots! Clean, secure and everything we needed for out trip. The owner was easy to work with. Spent the Labor Day weekend at 314 Makai with my husband and friends and had an absolutely terrific time. Weather was perfect and condo is beautifully decorated and well appointed. Plus it is located on the bay but only a short walk to the beach. We will definitely be looking to rent it again next year. Lovely well maintained condo with beautiful views. Drake is excellent with communications. The condo was extremely clean and the linens fresh. The view was amazing. NO traffic noise and other residents were respectfully quiet. Easy walk to the beach maybe 5 minutes. Variety of dining options within walking distance. Beautiful place and very clean with comfortable beds. Nice view from the balcony. Owners are very nice and communicated very well. Will book again. Definitely recommend.